The backyard view of our home best shows the many dynamics of the property. From a large enclosed porch, 2 fireplaces and a patio with a magnificent harbor view... its a great house for families and friends. Eat or lounge on the back open air patio and enjoy the view of the outer harbor which is adjacent to the Atlantic Ocean. One of the favorite gathering rooms is our living room in which the large fireplace is located. Watch TV or pick a book from the library. It`s a great room to sit and chat in a cozy setting. This photograph from the opposite end of the living room shows the cathedral windows and ocean views that lie beyond them. Cuddle up and relax on the large leather couches. You may need a blanket some evenings...you are in Maine. The dinning room is adjacent to the kitchen and can seat up to 10 adults. As you can see there is plenty of seating. Enjoy your morning coffee in any of the 3 areas you can see here. The open air out door deck, the enclosed porch or this small indoor table off the kitchen. We provide all the conveniences of your kitchen at home and plenty of pots, pans, utensils and dishes. The 2nd fireplace. shown here, is under renovation and will soon be part of the master bedroom suite. The master bedroom will soon enjoy a private fireplace shown in the previous picture. Some Maine nights are perfect for a blazing fire backdrop. A very romantic setting indeed. Here is another of our bedrooms with a double size bed ...and another of our 5 bedrooms is shown here- great for kids with 2 twin beds. If you need a little alone time to get some work done, you can set up your computer in the office&59; WIFI is provided with plenty of space to organize and store you work papers during your stay. Here`s one of the 3 bathrooms. If you`d like to enjoy the harbor view you can relax on the enclosed back patio. Take a nap, read a book or gather round for a chat. Slide the windows opened and enjoy the sounds and smells of the ocean. There are plenty of places to escape and enjoy privacy and solitude. Pull a lawn chair close to the harbor and watch the gulls and an occasional eagle. Sail boating is frequent coming and going into and out of the harbor. This backyard view of the house really shows how expansive the enclosed back deck is and if you look to the left, on the 2nd floor, you can see the cathedral windows in the living room. Here`s a curbside view as you pull up to our home - Atlantic Sunset. Surely you`ll remember this patio view when you fondly think back on your vacation to Maine`s coast. And we hope you want to come back again. Sunsets over Boothbay Harbor are magical. They have always been one of my favorite moments in the day to unwind... and for me..with a nice glass of wine Thank you for viewing our property. A classic seaside family home on the Atlantic Ocean is ready for you to settle in for a memorable Maine Vacation. This six bedroom, three and a half bath cottage is well equipped and comfortably furnished throughout. Its spacious floor plan and large windows offer plenty of gorgeous water views and cool ocean breezes throughout. Gather the family ‘round and enjoy the wondrous sights and sounds of coastal-Maine living here in Boothbay Harbor. THE HOUSE An updated colonial house with high ceilings and a natural feel on the inside. Large sliders lead to the open-air deck with incredible views of westward facing side of Boothbay Harbor islands and beautiful sunsets. 1st Floor – Large kitchen, dining and living room with all of the modern amenities. The enclosed porch and open deck overlook the entrance to Boothbay Harbor add nice living space to this already spacious home. A fieldstone patio in the front yard is ideal for outdoor dining. The newly remodeled Master Suite with Queen bed faces the Harbor and provides a spectacular view of the Harbor. The AIR Jet Bathtub is a great way to relax in the evening. and is also on the main level. 2nd Floor - King-size bedroom, second bedroom with one double bed and the third bedroom with one single-size day bed. One full bathroom. Lower Level – Daylight basement facing the ocean with family room area, a full bathroom, a bedroom with one double bed and a second bedroom with two twin beds. Bathrooms: (1) Full bathroom with AIR JET tub and a separate large curbless, doorless shower, double sink & toilet in Master Suite first floor, (1) Half bathroom with sink & toilet off the kitchen, (1) Full bathroom with shower/tub combo, sink & toilet on the second floor, and (1) 3/4 bathroom with shower, sink & toilet on the lower level. Guests at this pet-friendly cottage will enjoy water access and shared beach at the property. The post-card-perfect rocky coast is great for low tide exploration and tide-pooling. Rent kayaks and bikes from local shops to help make your vacation the perfect balance of fresh air activity and at-home relaxation. Passes to Spruce Point Inn have been provided by the owners, just a short walk from the house to the front office of the Inn. The passes provide access to Spruce Point Amenities, including fresh and saltwater pools, bicycles, kayaks, and many other amenities. You can also take a ride on the Inn’s shuttle boat from Spruce Point’s private dock, which will drop you off at the town dock in Boothbay Harbor! High-speed internet, large screen TV’s, VCR collection, reading library and board games are all included. Be sure to visit the Maine State Aquarium while you’re here as well as the Coastal Maine Botanical Gardens and the Boothbay Region Land Trust with its 30+ miles of pet-friendly trails in protected areas. 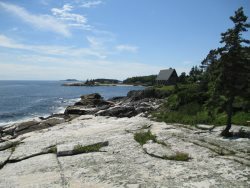 Experience Maine and all its beauty here at Atlantic Sunset. Off-Season Arrival & Departure dates may be flexible. The staff at Cottage Connection are always there to assist you when you need it. Friendly, professional and courteous. Keep up the good work Cottage Connection. From the ease of finding you on line when we began our search to our departure, things went smoothly. Our experience was first rate and we couldn't have had a better time! Atlantic Sunset had lots of room so we could all find a quiet spot when desired and yet could all be together for dinner and board games. The passes to Spruce Point Inn were wonderful - especially for the teenagers. Our granddaughters, nine & six, loved going down to the cove at low tide to collect sea glass & "critters". Please let the owners know that their home is wonderful and thank you for sharing it. Swimming Area Rating 5/5: Very easy water access, sandy or pebble beach, great for all ages! Privacy Rating 2/5: Semi-quiet location, neighbors close by, may have road noise.